The first regular Javanese gamelan ensemble in Dublin was formed in October 2012. At the start of 2015, just over two years later, there are no fewer than six different ensembles rehearsing and performing in Dublin, alongside a number of public workshops, which are ongoing in various education and health care settings. This adds up to some seventy gamelan musicians, and hundreds of workshop participants, representing a remarkable surge of interest in the music. So how did we get here? What exactly are all these musicians playing? And why? I will address this latter question first. There has been a great deal of research into the educational and social benefits of gamelan music. Newcomers to the gamelan all begin on a level playing field since the instruments come with no prior associations for them. This can remove the insecurities that many people experience when working in groups learning new skills. By the same token, the gamelan can unlock people’s creative potential as they have no preconceptions as to how the instruments “should” be approached. This makes gamelan an ideal vehicle for people to improvise and compose their own music. These exercises are in themselves an excellent way for any musician to get to grips with a new instrument and to understand it on their own terms. For this reason, members all of all the Dublin gamelan ensembles are encouraged to compose and perform their own music. It is also possible for newcomers to perform a simple piece of traditional Javanese music, even on their first day, and the immediacy of the results always has a visible impact on people's self-confidence, especially young players. And although the more advanced repertoire involves complex interlocking rhythmic patterns, at a basic level, most gamelan instruments are simple percussion instruments, hit with a mallet. This is why gamelan is so often used to help develop motor skills among young learners or students with special needs. There are also social skills – team work, group awareness, listening and communication – which arise from the system of aural cues that shape the music, and from playing with up to twenty people at a time. And because the first pieces any group will learn are usually arrangements of Indonesian children’s songs (as mentioned below), gamelan can also be applied to developing vocal ability and even language skills. In all of these ways, gamelans have been used not only in schools, but in hospitals, prisons and in a range of other social and healthcare settings, and even for corporate team-building exercises. For the more dedicated student of gamelan music, it is possible to devote many years of study to learning the more complex parts, especially on the softer instruments, including the gendèr (a soft-keyed metallophone), the suling (a bamboo flute) the gambang (a wooden xylophone), the siter (plucked zither), the rebab (two-stringed fiddle) and the ciblon (barrel drum). The interpreting of these particular instrumental parts in performance is one of the most interesting areas of research in gamelan music, because there is no one way to garap, or “realise” the part. Stylistic and regional variations play a huge role in interpretation, and what scant notation exists is usually passed from teacher to student, with very little having been published in English. I am currently in the process of translating several books of instrumental parts from the Indonesian, which I hope it will be possible to make more widely available at a future date. Attempts to get at the heart of Javanese music, to convey the theory or the meaning behind it, are an ongoing concern for many ethnomusicologists. While the history and cultural reception of gamelan music, both within Java and without, are also popular areas of research. Here in Ireland, what little research that has been done so far has mostly focussed on the origins and the rise of gamelan in this country. I am currently discussing with researchers the possibility of further examining the potential benefits of gamelan in education and health care, taking my own outreach projects as case studies. And I would further hope that, in time, some of my own gamelan students will go on to pursue further ethnomusicological study in the field, and so build up the knowledge base here at home. Indeed, I have already seen members of my ensembles submit theses, pursue postgraduate study, and undertake further study in Indonesia, so I am very much looking forward to a healthy growth in gamelan research in Ireland. It was when I left England after seven years of composing, performing, and later, teaching gamelan music, that I found myself faced with the possibility of no longer having the opportunity to play, since there were no active gamelan ensembles in Dublin at the time. I started investigating what would be required to set one up. I met with the National Concert Hall, who were more than happy to provide the space that would be needed, and later, almost by chance, I met with the Indonesian Ambassador Hamzah Thayeb, who offered to help. He explained that the Sultan of Yogyakarta in Java, Hamengkubuwono X, is someone who is dedicated to preserving and disseminating the ancient traditional culture of his region, and that he might take an interest in our project. And so it was, when the sultan heard of our efforts, that he offered to provide us with a purpose-built gamelan, to be built by his own artisans in Yogyakarta, and shipped to Ireland to be housed permanently in our National Concert Hall. 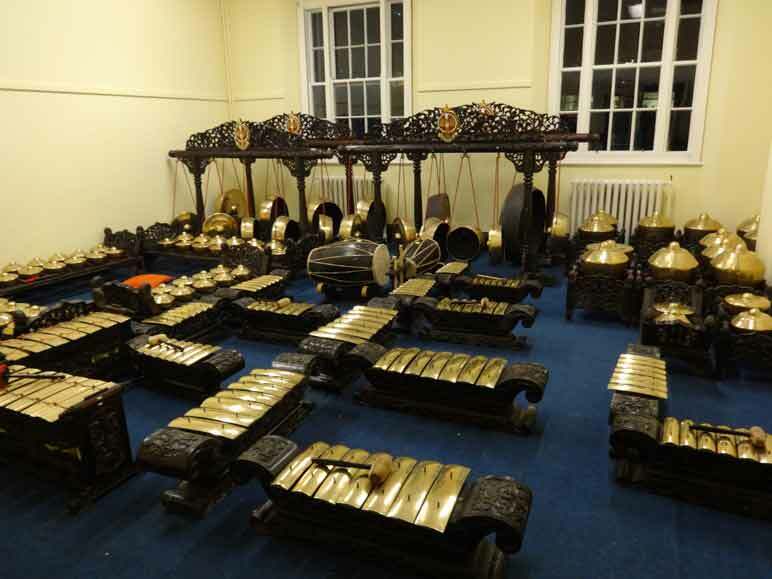 Remarkably, while this news was still creating a buzz of excitement, I was informed that a private collection of gamelan instruments from Dundalk was then being stored in the UCD School of Music. With the help of ethnomusicologist Dr. Jaime Jones, we received permission from the owner to continue housing the instruments in UCD and to open them up to the public. We immediately set up the first ensemble in the city, which began rehearsing in October 2012. We started of course with the basics; the one-note gangsaran, followed by simple lancarans like Gundul Pacul and Rick-Ricik, as well as some original compositions by our members. In time, the group were able to move on to the next stage, taking on core pieces of classical repertoire like Ladrang Wilujeng and Ladrang Pangkur. Our first performance was an informal event in the UCD School of Music in December 2012, followed by a public performance before the ambassador and other invited dignitaries in the concert hall's Kevin Barry Room in April 2013. The enthusiastic response from our capacity audiences, and further bookings from music festivals around Dublin city, including IMC's Down With Jazz and Dublin Culture Night, served to make this fledgling group feel a most welcome part of the city's musical life. Concurrent to that group, I set up another ensemble made up only of composers, who would not study the traditional repertoire (karawitan), but only compose and perform their own experimental music. Named Gamelan Nua, this ensemble gave their first public performance to another full house at the Kevin Barry Room in January 2014. Later that year, the UCD Gamelan Orchestra became an official department ensemble, with up to 18 students taking the module for credit each term, where they now perform at least once each term. All three of these ensembles got their start in UCD. As plans moved forward between the NCH, the Indonesian Embassy, and the sultan's cultural office in Yogyakarta, I was invited to spend the summer in Java, to meet the gamelan builders and to study the Yogyakarta playing style in more detail. The work was completed that autumn and arrangements were made for the new instruments to be delivered early in 2014. Immediately upon their arrival, the original Dublin ensemble, and the composers group Gamelan Nua, moved their operations from UCD into the National Concert Hall, while a new traditional ensemble for beginners was established to keep up with demand. This ensemble began, as the previous one had, with a repertoire of simple lancarans including Gugur Gunung and Kidang Talun, and of course the members' own compositions. It was announced that the sultan himself would be coming to Dublin with his personal palace musicians in September to give the new instruments their first public outing and to preside over the traditional gamelan naming ceremony. The two NCH gamelan ensembles – the beginners and the more experienced group – would perform for the occasion. After a lot of hard work and preparation, the event was a rousing success. The palace musicians themselves performed to a packed concert hall and received two standing ovations. In the midst of the concert, the sultan conducted the simple ceremony bestowing on the instruments the name Kyai Jati Roso, “The Venerable Pure Conciousness”. In the aftermath of the event, the Yogyakarta Cultural Office invited me to return to Java later in the autumn, with four other members of the ensemble, to perform a concert of all original gamelan compositions at the Yogyakarta International Performing Arts Festival. The programme we prepared included two items which had been performed in Dublin during the sultan's visit, which were now re-arranged for quintet; my composition Embat and Grant Davidson Ford's Sentuh Suara. We also included two more compositions of mine which had been commissioned previously by gamelan orchestras in the UK; the quintet Sailendra and my Bonang Quartet No.1. The final two items were composed especially for this occasion; Ford's duet for two sarons, and Kian Geiselbrechtinger's setting of the Irish text An Draighneán Donn, for gamelan and soprano. During our visit, we also had the opportunity to meet once again with the staff of the cultural office and members of the royal family, and the palace musicians who we had worked with in Dublin. We also met with local instruments builders from whom our members could buy their own instruments to practise outside of ensemble rehearsals. At this stage in their development, the more experienced players in the UCD and NCH groups are already studying the larger-scale classical structures, and more advanced instrumental techniques such as kinthilan, imbal and sekaran. While this understanding of the traditional repertoire develops, we will also be working on some of the large-scale modern works that have been written for gamelan, including full-scale concertos and a setting of the Latin mass. 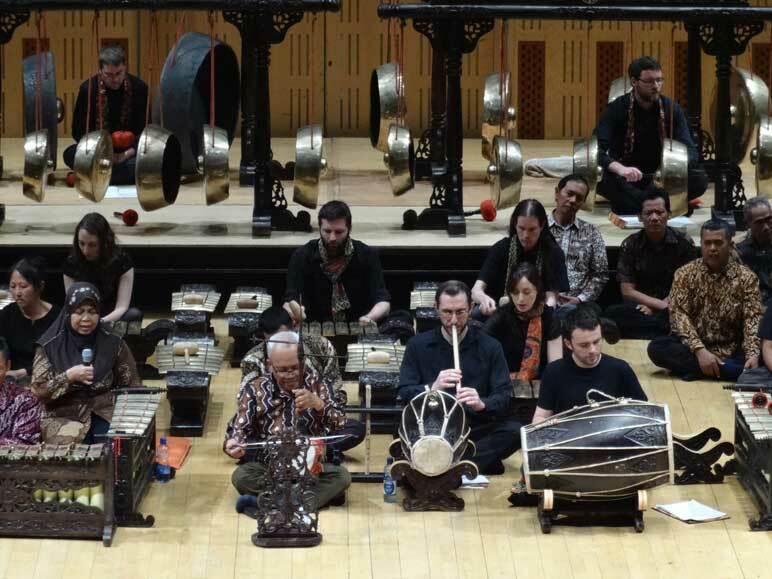 Concurrent to the two concert hall groups and the UCD orchestra, as well as the quintet and the Gamelan Nua ensemble, a sixth gamelan group will be assembled this year, especially for the upcoming New Music Dublin Festival. Exploring the benefits of gamelan as a compositional and creative tool, a group of 2nd- and 3rd-level music students will spend five weeks participating in the New Music, New Methods workshops, learning about the instruments and creating original compositions which they will perform at the festival. All six gamelan ensembles will be performing in Dublin in the coming months, with further concert dates and workshop opportunities to be announced shortly through the social media links provided below. 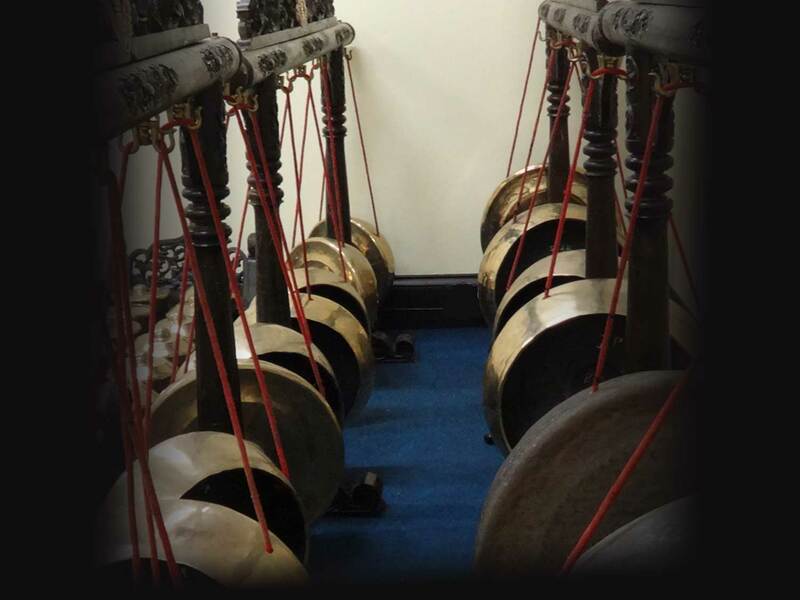 The NCH Gamelan Orchestras rehearse every Tuesday night, and membership is open to the public. No previous gamelan experience is required. The ensembles meet from 6-8pm (for experienced/professional musicians) or 8.15-10.15pm (for beginners/amateurs). Follow www.facebook.com/nchgamelan or e-mail education@nch.ie for details. Gamelan Nua is open to composers or performers interested in experimental music and improvisation. Contact www.facebook.com/gamelannua for more information.